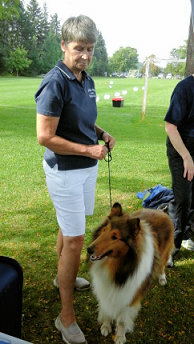 Our volunteer members teach community obedience classes year round, provide therapy dog visitation to local long term care facilities, seniors centers and schools, donate time and money to many local charities such as the food bank and the animal shelter and host an annual dog show that brings exhibitors from across Canada and the USA. A very busy club with a diverse and talented membership that includes law enforcement officers, teachers, MPP’s, union national representatives and local business owners all with a common love for dogs! As the only federally sanctioned purebred dog organization in Georgina we are offering our expertise to all who ask. GKOC participated in the RDOG (Responsible Dog Ownership Day) event put on by the Georgina Animal Control Sept 19, 2015. On Saturday September 19, 2015 members of the GKOC gathered at the Civic Centre to participate in a RDOG (Responsible Dog Ownership Day) event put on by the Georgina Animal Control. 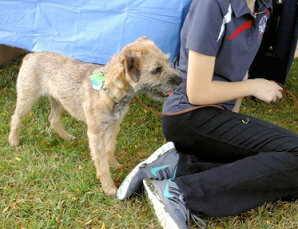 The program was to include a Microchip Clinic and a Dog Walk along with several dog related booths. There was a huge poster explaining about the cost to rescue wildlife - feeding and care - as Shades of Hope Wildlife Refuge was also to benefit from any profits. There was a good number of staff from Georgina Canine Control and the Animal Shelter in attendance to answer any questions etc. Bev had a booth from her Global Pet Food Store and the GKOC shared her pop-up. 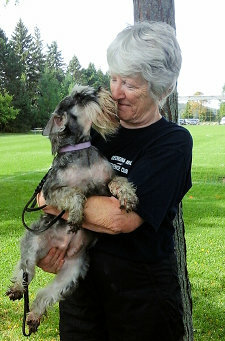 Members Bev, Alicia, Marja, Irene, Kim, Catherine, Ron, Jazz and Beth attended with their dogs. One of our Junior members, Alicia set up her Rally course and invited us to give it a try. Each of us took our dogs through. Several visitors tried it out with their dogs too. Our other Junior member in attendance, Jazz took photos of the day to share. All in all it was a fun time for attending members who got to meet in a casual setting with our dogs Our dogs sure enjoyed playing and got on well with each other. Sadly very few of the general public came out so from Georgina Canine and the Wildlife rescue's point of view it was not a very successful event. Hopefully next year the event will get better prior notice and folks will come enjoy the day with their dogs. The area around the Civic Centre is quite lovely and should be better used by members of our communities. The membership participates in events and around the town, helping to further good will and positive canine representation. The membership participates in events and around the town, helping to further good will and positive canine representation. The annual Keswick Santa Claus parade, the Sutton Agricultural Fair, local business openings, elementary school visits and therapy dog visitations are but a few of the clubs involvement's. 1998 saw the club join with the local canine control arm of the town to hold their first successful rabies clinic in Keswick. As a further gesture of good will, the club donated the moneys from the admission to the annual shows to local charities and to a bursary at the local high school. It is COLD out there - bringyour pets inside! Everyone wants their dog to be a good neighbor. Let us assist you reach that goal. We offer insight into dog behavior, assistance on specific problems and help you on your way to having a well behaved and trained dog. Click here to see classes being offered.